Prime rolled steel, interlocking construction for long life. Features 2 adjustable shelves, hinged door with a plated door handle to make opening easy. Keyhole slots for easy wall mounting. Holds up to 6 standard sized aerosol cans. 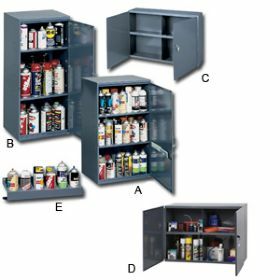 Unit can be wall mounted, fastened to a tool box, placed on shelf or counter top. Ltr. No. of Sections Size W x D x H Wt. (lbs.) Price Ea.